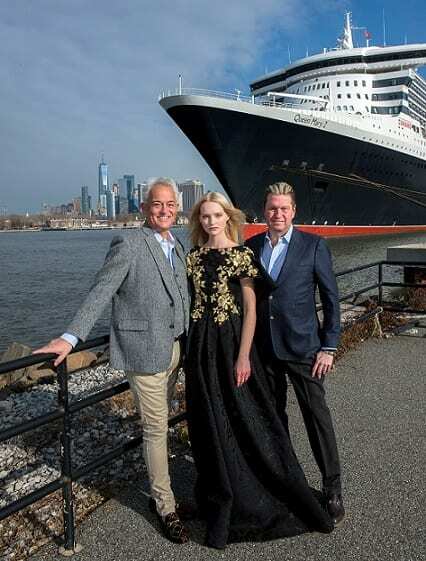 Luxury cruise line Cunard brings glamor to the high seas with fashion icons Mark Badgley and James Mischka, who will headline the brand’s fifth annual Transatlantic Fashion Week Crossing on flagship liner Queen Mary 2. Badgley Mischka will launch their 2021 resort collection in an exclusive runway show, the first time a fashion collection has been launched on a Cunard ship. In addition to the fashion show, Mark Badgley and James Mischka, will also offer Q&As with guests during the seven-night Transatlantic Crossing, which departs Southampton, England on May 24 and arrives in New York on May 31, 2020. Additional fashion experts joining the voyage will be announced at a later date. For three decades Badgley Mischka has been synonymous with glamour and elegance and known for their stylish and wearable evening wear and accessories. Hailed by Vogue as one of the “Top 10 American Designers.” They are an integral part of the fashion world, consistently offering sophisticated style that caters to modern couture customers of all ages. Their timeless designs have been seen on a range of A-list women, including Madonna, Jennifer Lopez, Rihanna, Sharon Stone, Jennifer Garner, Julia Roberts, Kate Winslet, Sarah Jessica Parker, Helen Mirren and Ashley Judd.